This third episode in the Kids' Ten Commandments series is based on commandments five and six. - Publisher The third episode in the K-10-C series, "A Life and Seth Situation, " is based on commandments 5 and 6--"Honor your father and mother" and "Do not murder." When Seth and his friend, Ephraim, go for a "sleep over" on the outskirts of camp against their parents' better advice, they encounter a ragtag bandit (special guest star Lou Diamond Phillips) and his gang on a pursuit across the desert. A sandstorm forces them into a cave that just happens to be the bad guys' hideout. The boys learn the value of obeying their parents and the sanctity of human life in this exciting, adventure-filled episode. 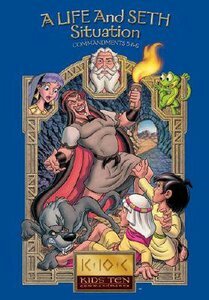 About "A Life & Seth Situation (#03 in Kids Ten Commandments Series)"
The third episode in the K-10-C series, "A Life and Seth Situation, " is based on commandments 5 and 6--"Honor your father and mother" and "Do not murder." When Seth and his friend, Ephraim, go for a "sleep over" on the outskirts of camp against their parents' better advice, they encounter a ragtag bandit (special guest star Lou Diamond Phillips) and his gang on a pursuit across the desert. A sandstorm forces them into a cave that just happens to be the bad guys' hideout. The boys learn the value of obeying their parents and the sanctity of human life in this exciting, adventure-filled episode. Customer Reviews For "A Life & Seth Situation (#03 in Kids Ten Commandments Series)"
This series is not a fast paced series and is a great for young boys to help them understand the importance of obeying parents and how unexpected bad things can happen when we disobey.